Two words: whiskey flights. 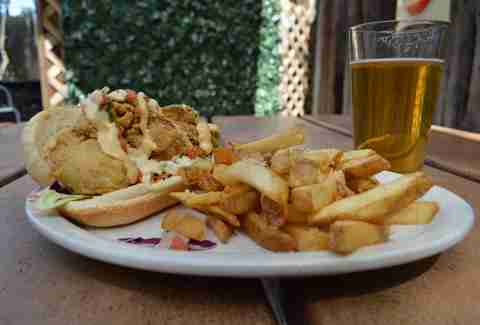 This Downtown Phoenix favorite is an upscale version of the traditional Irish pub, without straying too far from the roots. Decorated with fancy chandeliers and dark wood paneling, it has an ambience reminiscent of an American speakeasy tied to a European gastropub. You can’t come here and not test out the Irish whiskey menu, which features over 20 from which to choose. But please, don’t do it all on St. Patrick’s Day. That could get ugly. The East Valley’s award-winning Irish pub, The Harp, has put an American twist on some of Ireland’s most traditional dishes. Go and grab yourself some Irish nachos (waffle fries topped with corned beef, jalapeños, cheddar cheese, and chipotle sauce) or some Guinness fondue, which is served with pretzels. Of course, if you’re trying to go the more traditional route, you can't go wrong with the Cornish pasties, shepherd's pie, or Irish bangers & mash. Easily one of the most popular Irish pubs in the state, Casey Moore’s has been pouring beer in Tempe for years. And despite being supposedly haunted (seriously, people say this place has ghosts), it has a well of loyal patrons who come by day after day to grab a taste of its fine beef, seafood, and, of course, those oysters. Plus, with St. Patrick’s Day upon us, you can sure as hell bet crowds will be coming in droves to get some beer and Irish whiskey. Who knows: maybe a couple of ghosts will show up, as well. This place has been a Valley staple for over 30 years, and much of the reason is that it was the first bar in Phoenix to serve Ireland’s favorite beer (you know, Guinness) on tap -- which is kind of a big deal. While others have certainly followed in Rosie's footsteps, it’s the traditional Irish fare, such as bangers & mash, or the corned beef, that keeps customers coming in. OK, the Kell’s meatloaf sandwich, lamb burger, or corned beef on grilled rye bread also help a little bit. 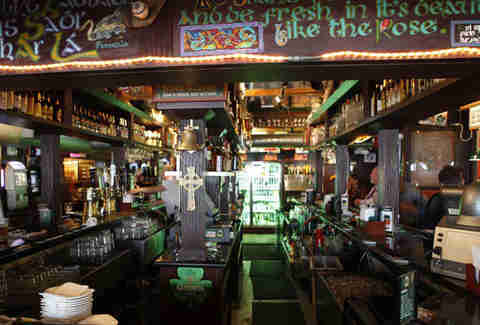 Finnegan’s has arguably the best selection of Irish beers in Phoenix, featuring anything from Smithwick’s, to Harp, even Kilkenny Irish cream ale. It also has an Irish cider, if that’s more your thing -- which, why wouldn’t it be? (Don’t get us wrong: it’s not that we have a drinking problem. We just appreciate a place with good booze and good company.) On the harder side, the Irish whiskey selection is something everyone should experience. And seeing that St. Patrick’s Day is right around the corner, there’s probably going to be a lot of people testing out the menu -- so get your spot! 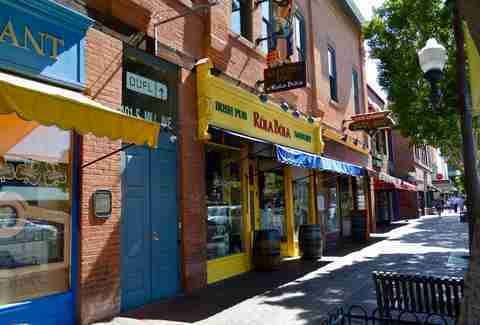 The name of this place is taken from the Irish expression, "Rí Rá agus Ruaile Buaile," which translates to “uproar and commotion” -- making it perfectly suited for a residence on Mill Ave, a place known for both uproar and commotion (in an entertaining way). 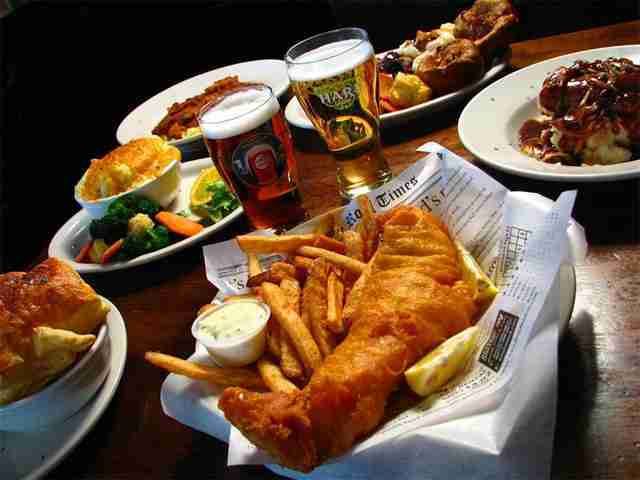 The pub mixes modern and traditional cooking styles and ingredients to comprise its eclectic, ever-changing menu. Visit late-night or stop by for brunch: it’s open seven days a week and has a killer daily happy hour from 3-6pm. The patio is also open, with more booze, and even live music. This Mesa sports bar/Irish pub is a hit with sports bettors, poker players, trivia junkies, and fans of Irish-style pub food. Try the deep-fried mushrooms & zucchini: they're fried in Harp beer batter and layered with sauces and cheeses. It also has a winning special (two-for-one burger Tuesday, anyone?) and a happy hour we can't not mention, since it runs close to all day -- Monday-Friday 11am to 7pm. 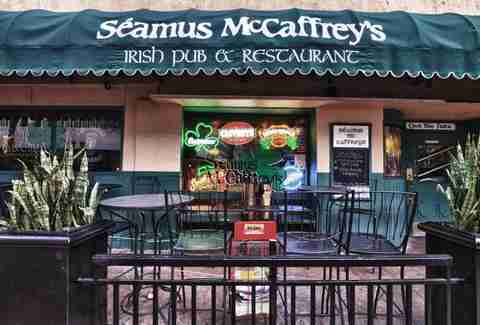 Bar food and Irish favorites such as beef stew, potato boxty, and corned beef & cabbage all come together to make up the menu at Séamus McCaffrey’s, one of Phoenix’s best pubs around. 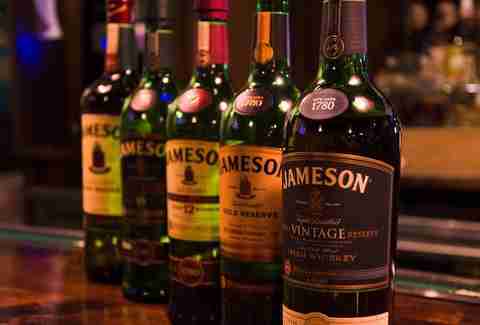 Stop by, raise your glass, and down a shot of your favorite Irish liquor any day you like (it has plenty to choose from). 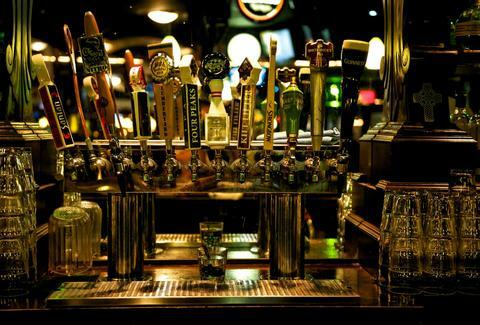 There are also happy hour specials Monday-Friday from 4-7pm, and live music every Friday night. If you’re looking for a different sort of glass, take a peek at the Scotch or wine offerings, or choose from a long list of imported and domestic draft beers. Scottdale’s Skeptical Chymist serves as the official meeting place for Seahawks fans in the Valley of the Sun. Why? Because it’s actually coined the “Official Seahawks Bar in AZ,” and shows pretty much all the games. It’s no surprise that you’ll get a taste of Éire here, as out-of-towners from the likes of the Pacific Northwest and Seattle come by to feel at home and embrace the love of their team -- all while munching on the notorious Belfast Burger. Stop by on Saturdays for a discount on the pub’s take on a famous Irish dish: corned beef & cabbage. Lauren Topor is a Phoenix writer who could easily have boxties for breakfast every day of the week. Follow her to the best St. Paddy’s Day parties around town on Instagram and Twitter.